This post is simply to cheer myself up and to motivate myself. Plus sort of recap. I didn't wrote my New Years resolutions. They usually don't work anyway but I had plans. I wanted to create a bit every day and share over at IG. It worked for a while. I also wanted to blog more often. That also worked in January but now we are at the end of February and this is only my 4th post. It doesn't mean that I don't like to do these things but simply you realize if you don't fulfill your plans nothing really happens. I get lazy and sometimes overwhelmed. I admit I also have a problem of being consistent. Not all is bad though. 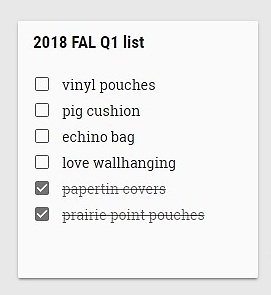 I'm still positive about completing few more goals on my FAL list. I made progress on love wall hanging. Yellow and green section is completely quilted and I need to get suitable red and blue thread to continue. I have also completed OMG goal for January and February which is good thing. So we'll see how it goes. It's usually either many things getting done or no activity at all. Hopefully I'll approach rising activity stage soon. I already have plans for my OMG March goal! My OMG goal for February was to use those fancy zippers. I found some tuts to help me out. It took me three attempts to install this first zipper. At first I sewed too close to zipper teeth and fabric was getting into them. My second attempt ended up even worse. I didn't catch the fabric at all. Yeah I didn't use pins. Luckily my third try worked. There is a loop at the back. I finished the binding by hand as I didn't have matching thread to stitch in place :) You can find the tutorial here. My second project was boxy pouch. My seam ripper had some work with this one as well. I didn't read the instructions properly. I just looked at pictures and that was not enough. Boxy pouches are not my thing. If you would like to try for yourself here is the tut I used. For my third zipper I didn't feel like using either tutorial again. I found another tut here. It's simple and quick. I finished the pouch with french seams instead like Lucy suggests in her post here. It's like pocket. I added small loop. I do like zippers. Especially bright ones. Regular type. To be honest with you I will never ever buy those fancy zippers again. They might look pretty but I prefer different type of assembly and shape of pouches. At least I finally used them and tried something new. I recently bought wide table for my sewing machine. The reason was my machine has a strange shape which was hard to copy and make as drop down into table. This wide table has changed the shape which suited my needs. That's how the process started. Handy husband is definitely necessary for this type of upgrade. White shelf was added to match the drawers. We have also added one more leg for extra support. Here is peak from below. But it was an easy fix. Looking good to me :) and there is FMQ challenge starting this Monday! Coincidence? It took me a while to figure out what my goal for this month will be. But I got it!